Liquorice or licorice is the root of Glycyrrhiza glabra (मुलेठी or जेष्ठमध) from which a somewhat sweet flavor can be extracted. Historically, the dried rhizome and root of this plant were employed medicinally by the Indian, Egyptian, Chinese, Greek, and Roman civilizations as an expectorant and carminative (prevents formation of gas in the gastrointestinal tract or facilitates the expulsion of gas). 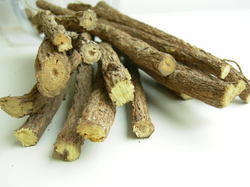 In modern medicine, licorice extracts are often used as a flavoring agent to mask bitter taste in preparations, and as an expectorant in cough and cold preparations. The flavor of liquorice comes mainly from a sweet-tasting compound called anethole, an aromatic, unsaturated ether compound. Much of the sweetness in liquorice comes from glycyrrhizin, a compound sweeter than sugar. Hepatoprotective: The compound glycyrrhizic acid is found in liquorice and is used for the treatment and control of chronic viral hepatitis. There is a possible transaminase-lowering effect & hepatoprotective mechanisms have also been demonstrated in mice. Antiviral effect: Recent studies indicate that glycyrrhizic acid exhibits a strong anti-viral effect. It is also used to treat Tuberculosis in most cases. Antioxidant / Anti-Cancer: Glycyrrhizza Glabra was found to be a potent antioxidant agent. Memory Enhancement Effect Antiviral effect: Aqueous extract of Glycyrrhizza Glabra significantly improved learning and memory. Its anti-inflammatory and antioxidant properties may be contributing to the memory enhancement effect through facilitation of the cholinergic-transmission in the brain. Blood Glucose / Anti-Diabetic Effects: Glycyrrhizza Glabra has a regulatory effect on the expression of genes that play an important role in glucose metabolism. Osteoporosis Benefit: Extract of Glycyrrhizza Glabra showed an inhibitory effect on bone resorption. This apart, Glycyrrhizza Glabra has several benefits that can lead you to a speedy, gentle, and enduring restoration of health in a least harmful way! Thanks for very valuable information which also includes knowledge about Glycyrrhizza Glabra. This is just natural gift by our Almighty. Thnx a lot.